The TP9SF Elite is the flagship of the series, with a number of outstanding features. The 4.5-lb. single-action trigger is smooth, predictable, and all-around great. It comes with industry-standard dovetail sight cuts that are compatible with a large variety of aftermarket sights. It also features a re-worked angular slide profile that should help to clear up the sight picture, and the decocker has been removed. It comes with Warren Tactical sights, and is finished in Olive Drab Green Cerakote for superior corrosion resistance. 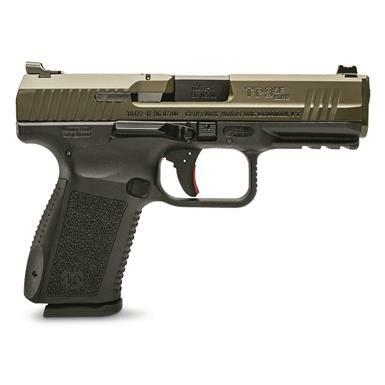 Century Arms Canik TP9SF Elite, Semi-Automatic, 9mm, 4.19 Barrel, ODG Slide, 15+1 Rounds is rated 4.0 out of 5 by 1. Rated 4 out of 5 by Bigmofo from uh oh well, here we go again. First let me say: I love canik pistols. I have 4 of them. They are accurate, reliable, and inexpensive. That being said, I recently ordered 2 tp9sf elites. One was the gray and black cerakote, the other was the new OD green slide.The gray one shoots flawlessly, brings a smile to my face. The green one, not so much. ITS THE EJECTION ISSUE ALL OVER AGAIN. I had spent brass all over my arm, head, and even in my t-shirt pocket. I thought this problem was resolved! I guess I will be calling century arms for a replacement spring soon, since my attempts to get this gun running correctly, have failed. So my friends, procede with caution.these are great guns,but the ejection problem, is getting old.